It’s a sad truth – black cats are often passed by when it comes to adoption. Those beautiful ebony faces and sleek black bodies just aren’t as eye-catching as the more brightly colored felines in the shelter. Mary Anne Miller, long-time kitty lover and advocate for cats in need, understands this fact all too well. She’s devoted much of her life to taking care of high-risk strays and at-risk bottle babies, nursing them back to health and helping them find loving homes. Mary Anne noticed that black cats were being passed over by potential adopters. “Don’t you have any other colors?” people kept asking her. 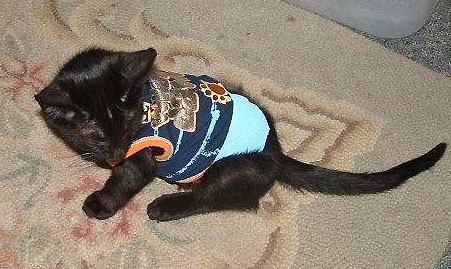 So she decided to play “dress-up” and started putting the cats in small-size doggy clothes. As soon as people saw photos of the black cats in their colorful attire the lucky kitties started flying out the door! One lady, who adopted not one but TWO black kittens, told Mary Anne that she had never considered bringing black cats into her home. Mary Anne says the clothing is only used for photo ops. Once the photo is taken, those clothes never go back on the cat. She also tells adopters that dressing up kitty (other than for Halloween or Christmas) should not be attempted. 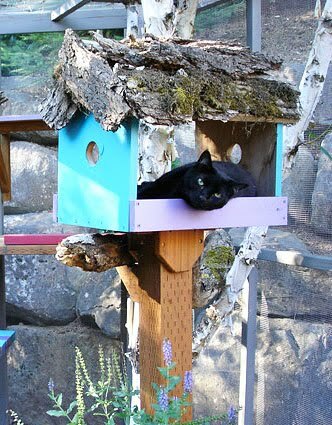 I ADORE black cats, like my sweetie-pie, Star, lounging in her cat enclosure. I can’t imagine not having this magical kitty in my life. I’m grateful for cat lovers like Mary Anne Miller, who devote their lives to bringing forever cats and their forever families together. You can learn more about Mary Anne by visiting Feline Express and Kitten Rescue. She is also in the process of forming a non-profit organization called CATS – Caring About The Strays. That’s my own black cat, Twitch. Anyway, maybe I could make some collars and send them over? Please go to my site to reply http://www.chrishugh.net/contact. Thanks! Chris, I took a peek at your website. When I have a moment I’ll have to read the Dan Brown parody! You may want to contact Mary Anne directly about your cat collars. You can reach her through her site http://www.kitten-rescue.com.